Vector Frame Kit 5 Display Stand will make your event/trade show display stand apart from the rest of the pack. 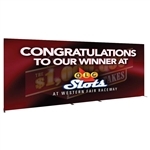 These state-of-the-art, modern design display systems boast heavy-duty, extrusion-based 50mm frames and vibrant dye-sublimated fabric graphics. Innovative construction makes set-up and tear-down a breeze. Available in a variety of configurations. Graphic Panels B/D/F: 70.866"w x 94.5"
Shipping Size: ships in 1 x OCH2 & OCE case , each sized 52" x 30" x 15"
Returns: Graphics are not returnable.